Similar to individual reports, Dashboards can also be shared, exported and published. This section explains how to perform these operations. Spiro Reports offers exporting and emailing capabilities which enables you to view the dashboard when you work offline and share them securely with users who do not have a Spiro account. Spiro Reports allows you to export your Dashboard as a HTML zip file or as a PDF. 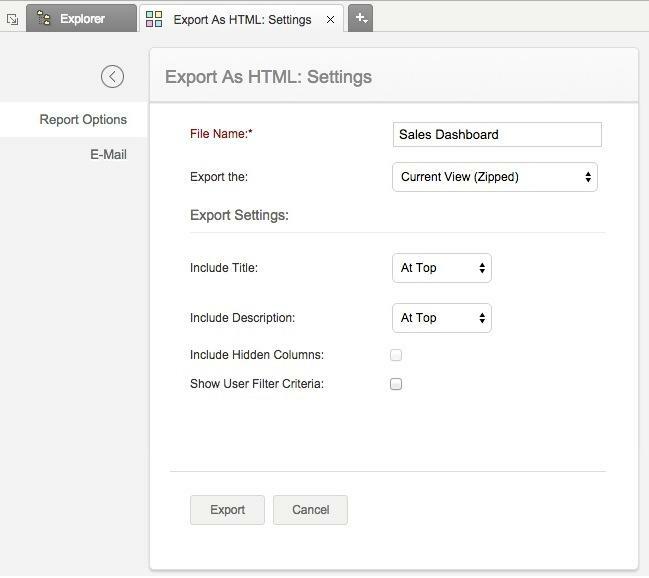 Follow the steps given below to export a dashboard as HTML. Click Export icon and then select Export as HTML. The ExportAs HTML : Settings page will open. Specify a name for the exported HTML file in the File Name field. Select required options to display title and description. The possible options to customize the layout of title and description are: At Top, At Bottom and None (without title or description correspondingly). Select Show User Filter Criteria option to add a label for user filter applied. Click Export. Your dashboard will be exported into a HTML file. Spiro Reports allows you to export the dashboard as PDF in two different layouts. This option will export the dashboard in the same layout as arranged in dashboard. This PDF export option is optimized for Dashboards containing charts and KPI widgets. Export may fail if it contains table styled reports, especially with huge data. Follow the given steps to export with Layout as in Dashboard. Click Export icon and then select Export as PDF > Layout as in Dashboad. This opens the Export as PDF : Settings page as shown below. This tab provides options to format the exported PDF. Specify the files name in the File Name field. Set the paper size on the Paper Size option, in the Paper section. Set the orientation as Portrait or Landscape. In the Zoom Factor in %, specify a value in percentage to scale the font size in your dashboards to fit to the page size appropriately. This could be scaled between 1 to 100%. Equal width for all columns - Choose this to have equal width for all columns. Proportionate width as in the report - Choose this to set proportional column width based on the design of the original report. This tab provides the page layout option. Specify the Margin (in Inches). Margin value should be between 0.0 to 1.0. Click Export. Your dashboard will be exported into a PDF file with the layout as in dashboard. 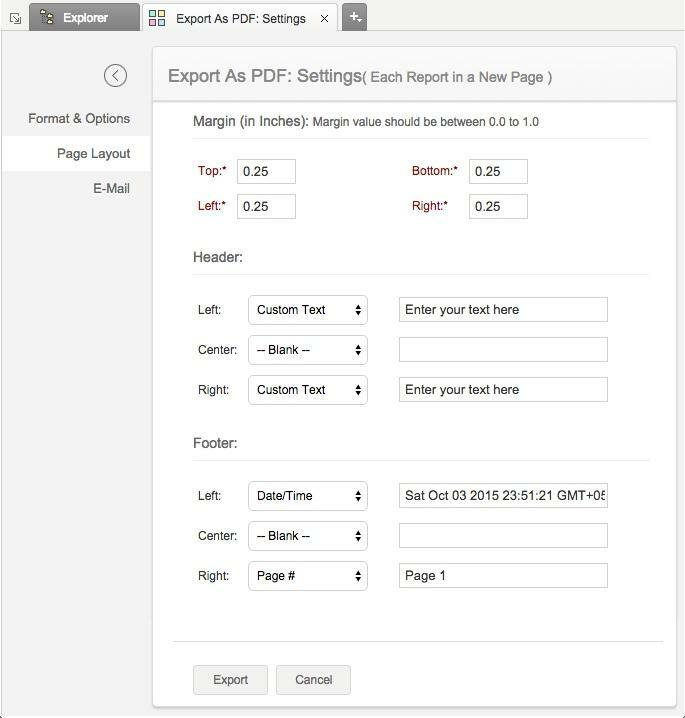 This layout will export the dashboard in a single column layout displaying each report in a new page in the PDF. This type provides the following benefits. Supports exporting dashboard containing tabular views with large data. Supports adding a Table of Content. Supports adding Header and Footer in each page. Supports more file size for the exported PDF. Supports displaying filter criteria applied in the dashboard level and in the reports level. Follow the given steps to export the dashboard with each report in a new page. 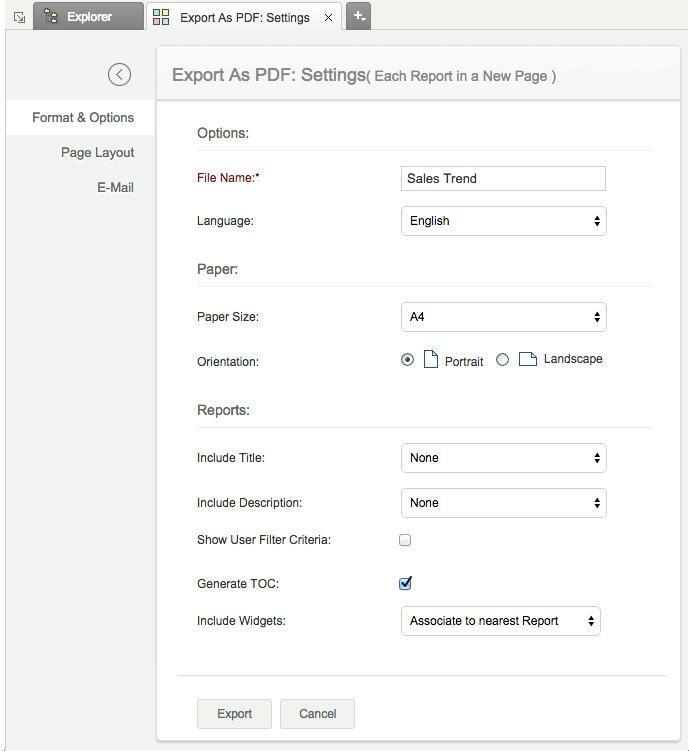 Click Export icon and then select Export as PDF >Each Report in a New Page. This tab provides formating option for the exported PDF. Specify the files name on the File Name field. 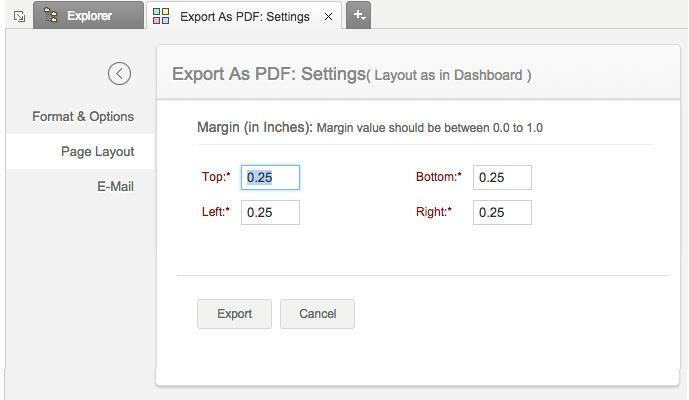 Select Generate TOC checkbox to include a table of content of your dashboard in the exported PDF file. Specify how to add KPI widgets in exported file in Include Widgets. Available options are. None - Select this to exclude widget from the exported copy. Each in a New Page - Display each widget in a new page. Associate to Nearest Report - Display widget along with the nearest page. You can choose to add Header and Footer for this layout. There are three position (Left, Right or Center) and you can choose to display one of the following in these position. Click Export. Your dashboard will be exported into a PDF file with each report in a new page. Spiro Reports allows you to e-mail your dashboard to your colleague and clients. You can also schedule emailing your dashboards. To e-mail your dashboard follow the given steps. Click the E-mail icon and select one of the following option. Email as HTML - Email the dashboard in HTML file format. Email as PDF - Email the dashboard in Portable Document Format (PDF) file format. E-mail tab provides various options to specify users email addresses and to customize your message. Specify the email addresses in the Enter E-Mail Addresses text box. You can enter the email addresses by typing them or by selecting from Spiro Contacts/Shared User list. 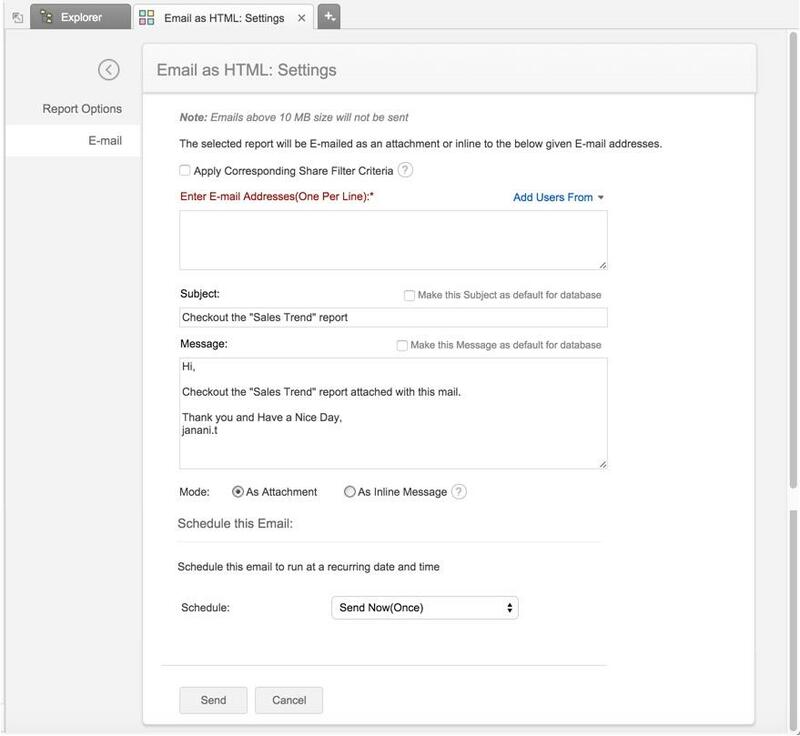 Customize your e-mail subject and message using the Subject box and the Message box respectively. Specify whether the dashboard should be mailed As an in-line Message or As Attachment in the Mode. This option is available only for emailing as HTML file. You can also schedule to send exported copy at a recurring date and time using the Schedule this Email options. Click Send to send the report to the specified users. Other setting will be similar to that on Exporting option. For details refer to the corresponding section in the Exporting Dashboard document. Spiro Reports allows you to share your Dashboards to your Users and set permissions like Read, View Underlying Data, Drill Down, Export and Share such that the shared users would be allowed to do only permitted actions when they access the shared dashboard. Refer to the topic Sharing and Collaboration to know how to share your dashboard. Spiro reports also allows you to embed your dashboards, you create into a website, web application, blog or an intranet page. Refer to the topic Publishing Options to know how to publish your dashboard.